Gokukoku no Brynhildr (極黒のブリュンヒルデ) is a story about aliens, believing in the supernatural and a death that made a non-believer into a fighter, into the biggest supporter of the theory he once thought absurd. Meet Ryota Murakami and his friend Neko Kuroha. Neko is a very energetic and intuitive person who takes a special liking to the topic of aliens. She wholeheartedly believes in their existence and is devoted to this idea. This is a result of an event she claims to have experienced – a close meeting with creatures from another planet. One day, she meets Ryota and he falls in love with her. Due to this infatuation, he is able to believe almost everything she says, but the existence of aliens is a far-fetched idea for him. One day, Neko decides to actually show him the otherworld beings. Something goes wrong. Neko dies and Ryota is left with the crazy obsession and a promise he made to her. After years of a tormenting living, a new transfer student comes to his class. As a surprise, but not necessarily a good one, her name is also Neko Kuroha and she looks just like his old friend. The strangest part of this encounter is, however, that she cannot recall any information of ever meeting her new classmate Ryota. Be careful not to miss this adaptation of Lynn Okamoto‘s original manga! It’s staring on 6th April 2014 at 10:00pm on TOKYO MX. 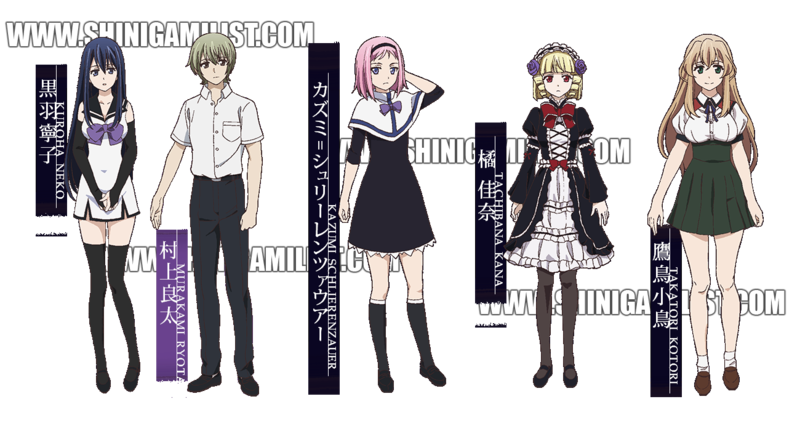 Neko Kuroha (played by Risa Taneda) and Ryota Murakami (played by Ryota Ohsaka) and the main characters and participants in the story. Kazumi Schlierenzauer (played by M・A・O) is an able hacker and a child from an Austrian and Japanese parents, resulting in her speaking natively both Japanese and German. Kana Tachibana (played by Aya Suzaki), who is a friend of Neko and a very smart girl who is, however, sick from an unknown illness and is permanently bedridden. Kotori Takatori (played by Azusa Tadokoro). She is a first-year in Murakami’s school. Kurofuku is another character in the series; his duties include working under Ichijiku and discovering the current whereabouts of escaped wicthes. His seiyuu is Tatsuhisa Suzuki. Ichijiku Chisato is the director in the research institute who specialises in witchcraft and sorcery studies. His seiyuu is Hiroki Touchi. The main cast is also performing the ending theme song “いちばん星 (Ishiban Boshi)”. The lyrics are by keity.pop and the music, composed by Yasunori Mochizuki, is arranged by Shigeo Komori. Sounds amazing to have the seiyuu of Xenovia (high School DxD New), Mako Mankanshoku (Kill La Kill), Jun Sakurada (Rozen Maiden) and Makoto Tachibana (Free!) all in the same show, doesn’t it? Yet, the staff members are also quite the names! Directing the show is Katekyo Hitman Reborn!’s Kenichi Imaizumi while writing the script is Hamatora’s Yukinori Kitajima. Chief animation director and character designer for the project is Dog Days’ Hiroaki Karasu. While Ryota is trying to decipher alien codes and his schoolmates get involved in something huge, many things happen in the research facilities where Kurofuku and Chisato-san work… Everything can be seen in this show – from witch and witch-hunting to romantic emotions that only high school students can experience. The production team promises frighteningly strong effects on the viewer as they adapt one of the most adored mysteries in the recent manga years.